A beautiful weekend has come to an end. The weather was more than perfect with clear and crisp skies, bright and sunny, chili and tickling wind. Wish I could freeze this weather, I embraced it and found myself in bliss. Over the weekend I was seen enthusiastic about biking and motorcycle riding as I won’t be able to do these two activities after winter hits. On the other hand, I was quite inactive when it came to cooking. I tried to find all sort of lame excuses to keep myself away from the kitchen and I succeeded in that. Today, when it was lunch-time I thought of satisfying myself with some quick salad and fruits. I felt way too comfortable on my couch, and thought may be I should skip lunch. Browsed through the internet, watched some TV and finally I flipped the pages of some of the cookbooks that was lying on the coffee table. The pictures on it made me drool and I felt like making some of the dishes right away. 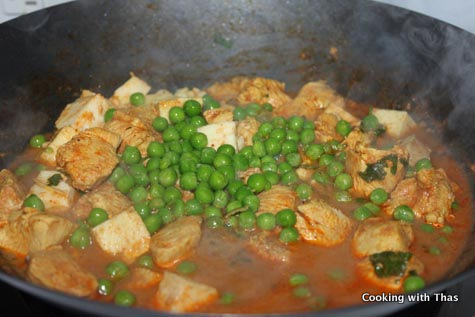 More flipping and I swiftly landed on the page that had the recipe for Balti chicken paneer and peas. I quickly read the recipe and found that I had all the ingredients to make that including paneer. I made up my mind, that’s it no more lame excuses and I started making this dish. 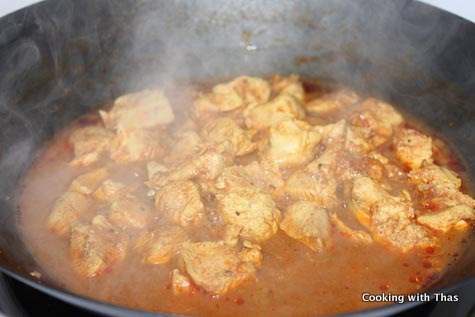 Some of you might be wondering what Balti is. Well it’s the name of a cuisine which is famous in the UK. Wiki says: It’s a British-style type of curry cooked and served in a thin, pressed steel wok like pan. The origin of this cuisine is uncertain, however it is believed to have adopted from pakistani or Kashmiri style of cooking. Balti means ‘bucket’ in punjabi and refers to the wok in which the food is mostly served. This was the first time I tried a Balti dish, it’s very similar to North Indian cuisine. This dish tasted mild yet rich and scrumptious. 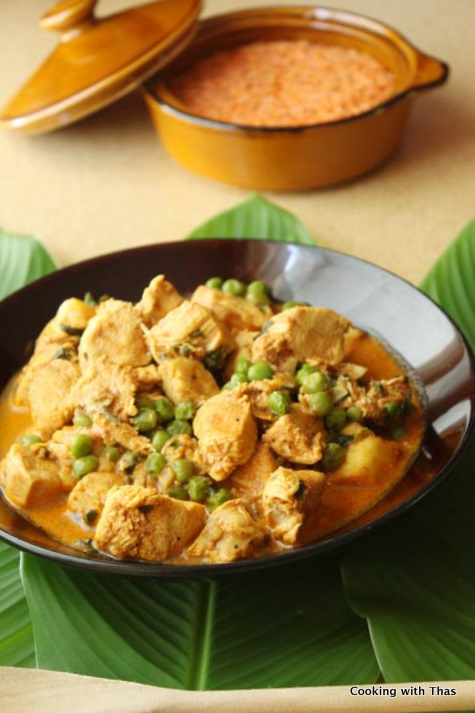 The addition of paneer and peas enhanced the flavor of this chicken dish greatly. 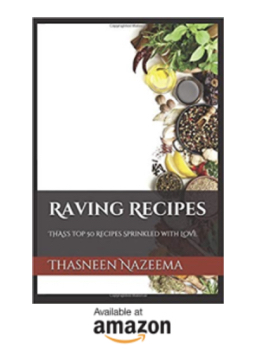 This recipe is adopted from one of my favorite cookbooks: Indian, Chinese, Thai and Asian – 1000 recipes. In a bowl, combine all the ingredients mentioned to make the paste, keep aside. Heat a wok or large pan over medium heat, add oil. Add whole cinnamon and whole black pepper, saute for a second. 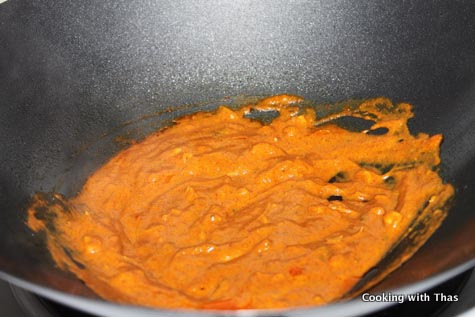 Now, add the paste to the oil, combine well and cook for 2-3 minutes, stirring constantly. Pour the water and combine well with the paste, let it come to a boil. Add the chicken to the water and stir for 2 minutes. Cover the wok or pan with its lid and let the chicken cook well for 15 minutes. Open the lid and cook for some more time till the chicken has cooked well. 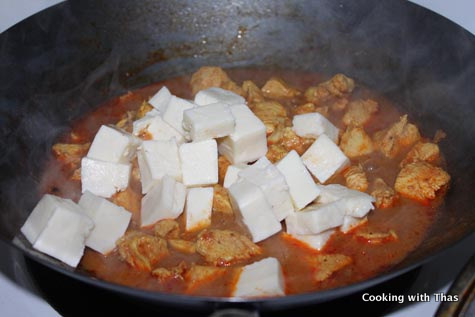 Add the paneer, combine well and cook for another 3-4 minutes. Have a taste and adjust the salt and spice according to your needs. Add the chopped cilantro and peas to the cooked chicken. Combine well and cook for a couple more minutes. You could either make this dish into a dry one or leave some gravy in it. 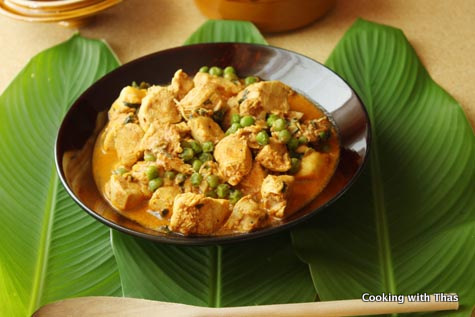 Transfer in a bowl and serve with rice or roti. Vegetarians can try this just with paneer and peas.